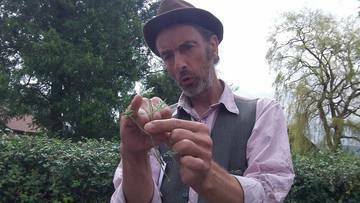 Chris Hope, aka Ipso phyto, is the wild plant and foraging educator from The Wild Plant Guide. Chris teaches about wild foods in numerous towns and cities, all year round. At Hedge-U-cation Family Camp, Chris leads wild food foraging walks, plant identification workshops and experimental wild food culinary adventures in the Wild Food Lab! The foraging programme includes daily morning forage walks, including some basic gastronomical botany, as well as a range of different afternoon workshops. These will include sessions on wild food preparation, cookery, and the simple to learn, off-grid preservation techniques of lacto-fermentation. There will also be a kid’s foraging challenge! To aid and abet your foraging adventures, Chris will be bringing some free information handouts. Chris also publishes foraging resources such as Top Trumps-style educational playing cards, colour-coded harvesting charts, the Wild Plant Guide calendar and waterproof wild plant identification cards. These will be available to buy from him at the camp, and can also be purchased online from the Wild Plant Guide website. The wild food foraging walks and workshops take place every day of the camp. However, this is a popular activity and spaces will be limited, so please book at your earliest convenience. The full wild food foraging programme will be published here prior to the event, and will also be available at the Camp office.